I agree that the Nephilim raise difficulties. But I'm not sure that a union between a spiritual person and a merely-biological-human would produce "men of reknown", significant even in an account told by the entirely spiritual. Why would the Nephilim, being - according to your description - some kind of half-breed, be different from the ones you describe as being brought into the spiritual line? As to the Flood, my belief is that it really was global. Genesis 7:19-20 is fairly specific; mountains were covered, and to some significant depth. The Ark was huge - there's no reason that it couldn't have had representatives of every terrestrial beast type. 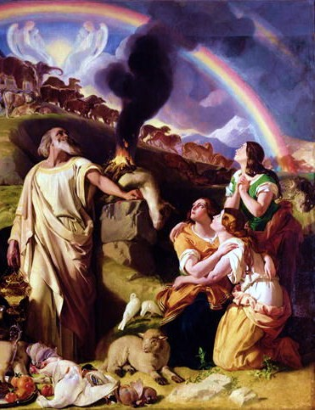 And what's the promise of Genesis 8 and Isaiah 54? God is promising never again to deluge the world completely - He's not saying there'll never be something like Katrina. Whether there were penguins on the Ark I don't know, as they may have been able to survive in water. (There won't have been any fish or other aquatic beasts on board, obviously.) The Ark was a means of survival, and it was there because anyone not on board would die: that's why it's used as an analogy for salvation of the soul. Jesus talks of it; and more directly, the Apostle Peter (1 Peter 3). If there could be some other way to survive in Noah's day, how do we know there isn't some other way to survive now? Conversely, if Jesus' death and resurrection make for us the only hope of salvation, an analogy with something where anyone beyond a certain distance survives automatically... makes no sense. The Flood had to affect every human being alive at the time, just as sin affects everyone - we can't, for instance, travel to another planet to escape the final judgement. There's evidence of water damage all over the planet. If the Flood had affected only a part of the world, we should be able to see a boundary: this is where it happened, this is where it didn't. But if the Flood covered the whole earth, it would make sense to have the same kinds of effects everywhere; stuff torn and inverted, and polystrate fossils anywhere in the world (the Wikipedia page on polystrate fossils says that "[b]rief periods of rapid sedimentation favor their formation", and a global flood is exactly that); there's no particular difference between one part of the world and another. What evidence is there that the flood wasn't over the whole earth?